As you might be aware, we've just launched the Community Portal on Lostpedia. This might just seem a fancy way of saying "Front Page - Page 2" but its so much more than that. The portal is designed to help you as part of the community, and Lostpedia in targeting the articles that are in need of most attention, the stubs, rewrites and cleanups that have been highlighted, as well key articles that could do with focused work, in something we like to call Article Attack. 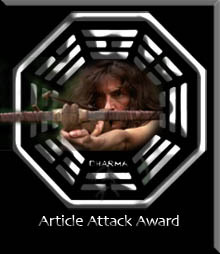 Each week, the best contributor to the article being highlighted in the Article Attack will be awared the Triple AAA, and no we don't mean a life-sized cut out of Adewale, we mean the Article Attack Award. This award will only be given to one person a week, so if you really work hard on the attack articles, by this time next year, we might only have 5 or maybe 6 people, with these awards littering their user page! Of course, the Community Portal isn't just for Lostpedia to get better, its for the users to be able to communicate with each other and the SysOps, this is why we've launched this blog so we can communicate with yourselves, and you can feedback on what we're thinking. It is also the new home of the forums and the (until recently) quiet chat room on Gamesurge.net. This lets you not only chat with each other and discuss theories to your hearts content, but allows you to talk to the SysOps, who normally loiter around the IRC room most days. It has got a lot busier recently, with the user count doubling since we introduced a link to it from the front page. This link is now to the new Community Portal, so current chatters, don't fret, we're still there, just part of a larger network of community tools! Last, but not least we have the help section. We've realised that many of you were asking for a place you could find easily that will help you with the etiquette on the site. Especially the big "What constitutes a theory?" question. Well, the help section of the Community Portal should go someway to helping you understand the difference between theories and speculation and where each of these belong. If you have any comments about the Community Portal, you can leave them here on the blog, or on the Portal's talk page. Of course, we haven't finished with the improvements to the site yet, not by a long stretch! We're working hard on finishing something really, really special off for you, codenamed "Lostbook". Whilst I am not at liberty to say exactly what we are doing just yet, as I'd like users to be surprised when you see it, what I can say is that it has taken myself and Jabrwocky weeks to get this ready, and I'm very excited about launching it. We have a sneak peek of the work in progress on the right hand side of the page. Hopefully, you'll be seeing it a few weeks after I Do has aired, just in time for the UK launch of Season 3. I haven't told you anything, but I'm sure you can fill in the blanks for yourselves!